Canadian-born ... living between Tuscany, Sicily and the Sahara. I am self-taught and I started painting in 1997. First with the figurative experimentation, trying several techniques of the great masters, I was most of all influenced by Modigliani, my spiritual Master, which I have reproduced more than 80 works. I gradually adopted a more personal style but remaining always figurative. It is only recently that I found in abstract art the best way to express my creativity, my feeling of the moment. My paintings have changing contrasts over the emotions, they do not follow any rule and reflect the harmony and the feeling of the moment, one in which they have just been created. Often when I paint, I have no intention or any idea of the final result’; paint becomes a magic moment, almost a meditation. As Jackson Pollock said: "painting is a state of being ... .a discovery of oneself. A true artist paints what he is. " Do not think, but let go of your body, your soul and your senses express themselves on canvas ... ..in listening to the silence. Yes, I can now say that my inspiration comes from silence. Perhaps this same mystical silence that I discovered few years ago, in the vastness of the Sahara. I never made art a profession and it is only in recent months that I fully devote myself to my passion. 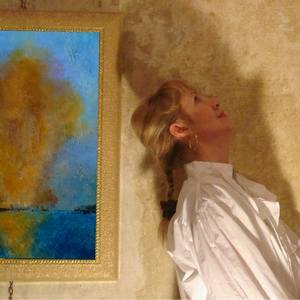 My paintings are part of private collections especially in Italy, Canada, France and Tunisia.